A very Happy New Year to our Members, Associates, Supporters and Friends and I send you all best wishes for a healthy and successful 2019. The weather has been becalmed of late and the year has started gently but there will be turbulent waters ahead in the financial and political arenas which will prove challenging for many of us. This makes it even more important that we work together to support the lives of people in debt. I am excited about the opportunities and plans ahead for MALG this year. January sees the launch of a brand new MALG Region in the South West and then February arrives with our first National Members Meeting of the year; further details on this can be found below. After the success of the Talk Money Conference last year, we have already started our planning for this year’s event which will be very different. I will let you know our plans in due course. As mentioned above, the inaugural and first South West group meeting will be hosted by Bournemouth Water (part of South West Water) on 24th January 2019 with further meetings set to be held in Exeter and Bristol. 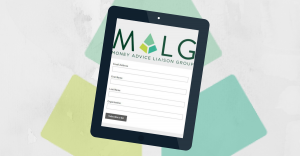 The next MALG Members Meeting to be held on 7th February at Dentons LLP, 1 Fleet Place, London EC4M 7RA. The full agenda can be found here. We have some fantastic speakers lined up including Rich Sullivan-Jones, Audit Manager of the National Audit Office, Money Advice Trust and Angela Crossley, Head of Insolvency Practitioner Regulation of the The Insolvency Service as well as the usual regulatory updates and key dates for your diary. I hope to see many of you there and to register your place please email info@malg.org.uk.